This is the new fast-paced Haunted Guesthouse Mystery that fans of the series will absolutely love. For those who have not yet met Alison Kerby and her group of both dead and undead family and friends, she’s the owner of the Haunted Guesthouse located in her hometown of Harbor Haven, New Jersey. She spent a ton of money to renovate this huge Victorian home and has done well with her business. After all, people love ghosts, and the “spook shows” that occur inside this house have people coming from all over to stay there. But lately, the spooks are not as inviting as they used to be. Alison knows the reason why. One of her best performers, Paul Harrison, has vacated the property. These are not actors; these are most definitely ghosts. You see, Alison had an accident a while back where she suffered a blow to the head and woke up with the ability to hear and see ghosts. She met Paul Harrison and Maxie Malone inside the old Victorian and made a deal with Paul. He had been working as a P.I. when he died and would haunt the house and bring her in guests if she would take the P.I. test and become his “eyes, ears and legs” in the industry. But when she said the deal was over, Paul said so long. Out of the blue Paul’s brother Richard appears inside the Victorian. He was defending a woman accused of murder, fell in love with her, and was murdered by someone who thought Richard had gotten too close to the truth. Alison is all of a sudden thrust back into the P.I. game, attempting to solve the crime Richard could not, find his killer, and track down Paul whose help and presence she definitely needs. The plots in this series keep getting better. This is one that comes with wit, charm, suspense, humor, and characters you will not soon forget. 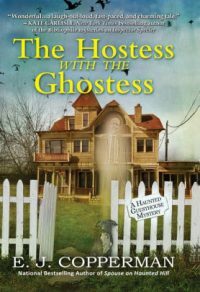 Be the first to comment on "“The Hostess with the Ghostess” by E.J. Copperman"